French company Arturia is extending its reach into hardware with the Minibrute 2 – the reincarnation of the analog monosynth that first hit the shelves in 2012. Thumping bass lines and searing leads: the Arturia MiniBrute 2 is here with new aggressive tones, two oscillators and a 48-point patch bay. The big-ticket addition to the new synth is the 48-point patch bay for further sound-sculpting capability. 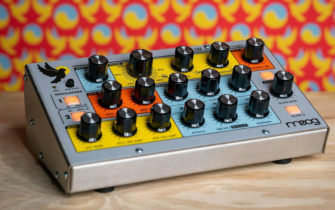 It also means it can be connected with other Eurorack modules in a larger modular system. Aside from improvements in connectivity, the Minibrute 2 has also evolved under the hood. It features two oscillators with waveform mixing, a Steiner-Parker filter and the Brute Factor feedback circuit. The new monosynth boasts 25 full-size keys with aftertouch, hybrid step-sequencer and arpeggiator with pitch and modulation wheels, features that make it eminently playable and tweakable on the fly. Head on over to Arturia for more details.